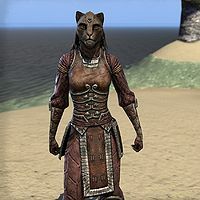 Aelif is a Khajiit member of the Fighters Guild. She can be found in every alliance's territory as she is major character in the Fighters Guild story. You first meet Aelif after saving her from daedra. She continues to aid you in finding Molag Bal's weapon. It is eventually revealed that Aelif is actually a worshipper of Molag Bal. She attempts to convince you to kill guildmaster Sees-All-Colors, which may or may not be successful depending on your choice. She can later be found in Heart's Grief during the final part of the Main Quest, where she is being tortured for eternity by Molag Bal. Attempting to free her will transform her into a hostile Bloody Skeleton. The Guildmaster sends you to find Aelif and Merric, who are looking to destroy some Dark Anchors. You find them fighting off some cultists, then introduce yourself to Merric, who will welcome you and tell you to search the bodies. After this, Aelif and Merric has a little conversation about you. If you talk to Aelif, she will direct you back to your task: "You heard Merric, new blood. Search those bodies. Aelif will check this one." Search the bodies of the cultists. A projection of a Dremora woman appears: "Cease your meddling, scum! The Redguard's soul will fuel the Mortuum Vivicus. Nothing you can do can stop it! ", to which Aelif will exclaim: "Dark Moons! What was that?" Talk to her. "That vision! A Dremora woman, talking about Merric. Why would she want my hapless companion?" "Aelif has no idea. Whoever she is, she is no friend to the Guild. Or Merric." She's after his soul, she said. "It would seem so. This one cannot imagine the value of such a thing. Too shiny, and dripping with pride. Just the same, we must warn him. And the guild. Aelif will go after Merric. Return to Sees-All-Colors. Tell her what you have seen. Go!" Talking to her after this, she'll emphasize, "Return to Vulkhel Guard quick as you can, comrade. Sees-All-Colors must know!" Return to Sees-All-Colors, then look again for Aelif and Merric at Sees-All-Colors' request. 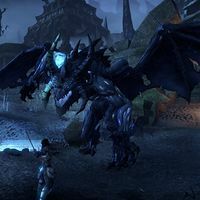 You will find Aelif locked in a fight with various daedra. Aelif: "Welcome to the fight, comrade. Claws out, and watch yourself!" Doshia: "Fools! You cannot stand against the might of Molag Bal!" Aelif: "More coming. Brace yourself!" Doshia: "Cease your meddling, mortal. The Master has plans for the Redguard." Aelif: "What was that voice?" Doshia: "Quite the little fighter. We're not done with you yet!" Doshia: "Hah! You're too late! I've found him. The Redguard is mine!" To this, Aelif will react, "Merric ran off after some other Daedra. Get after him! Don't let her take him!" You are too late: the Dremora tkes Merric. Aelif runs up to you: "Merric? Comrade? What happened? Where did you go?" Talk to Aelif. "Doshia! That such a weakling could take one such as Merric..."
"How would Aelif know? She was behind you." Perhaps we wait for Sees-All-Colors? She said she'd rally the Guild. "Oh yes, Colors, the heroic Guildmaster. Pff. We don't need to wait for Colors. You and Aelif are more than smart enough to figure this out. Here, give those items you found on the cultists." Who was that woman? Who kidnapped Merric? "You didn't recognize the Dremora from her projection? I think her name is Doshia. Quite full of herself, actually. Hmm. This note mentions an "island tower". Aelif wonders if it speaks of Buraniim." "It's an old Ayleid ruin. A tower on an island off the coast of Skywatch. Go, seek Merric there. Aelif will find our heroic Guildmaster and find additional blades." "May good fortune stalk your steps, comrade." What did you think of those objects I found? "Which do you mean? The gear? Or the relic?" Tell me about the gear. "Ancient. Dwemer. Worn in places, this piece was used in one of their constructs. Smells... fresh in some ways. Has been away from any ruins for a while. Shame. Might have been able to learn something more." Did you notice something about the relic? "Crude construction, shaped by small fingers. Female Breton... perhaps Wood Elf. Colored from clay. This region, so more likely Wood Elf. Smells burnt, of cinders. Shaped near a wood-fire stove or kiln." "Crude construction, shaped by small fingers. Female Breton... perhaps Wood Elf. Colored from clay. This region, so more likely Breton. Smells burnt, of cinders. Shaped near a wood-fire stove or kiln." "Aelif makes her way as she can, helps the Guild as she can. Just a humble Khajiit. Originally from the city of Dune. This one is of little importance." Save Merric. Outside Buraniim, Aelif will say, "You're alive? You surprise this one. You're stronger than she thought." After speaking with Merric at the Guild Council, go to speak with Aelif who will be outside. "You have spoken to Merric, then? Seen the council? It is about time we acted." Good to see you too, Aelif. "This one apologizes, comrade. She has been urging action for some time. Finally, to be able to … ahem. We have been tasked with investigating Jofnir's death, yes? We should begin." "Jofnir kept a room nearby. Aelif gave instructions no one was to be allowed inside until we arrived. I shall keep watch here. Enter Jofnir's quarters, and search for … something. Anything, to suggest a road to travel." After agreeing to investigate, you can ask Aelif some more questions. "Aelif knew she could trust you." Why aren't you with the council and Merric? "Too many voices. All of them very important, used to being heard. They want this mystery solved and they want it solved now. They are used to combat, direct action. All this thinking hurts their heads." "Heh, Aelif would have hoped you'd notice by now. This one loves to fight. Loves the thrill of combat. But a thorny puzzle, a tricky lock, a track to follow in the woods? Just as much fun as a blade in a brawl." "Anything our of place, anything connected with a place or person. We thought his death just the touch of chance, so we did not know to search. Anything might be a clue." How did the guild think Jofnir died? "We found him in his quarters. The endless sleep. It was very sudden. But at the time, we thought nothing of it. Jofnir was getting old. Sooner or later one of the faster blades would have made him sit down." "None. And slow though he was, he never would have gone to … what was it? Yes, Sovngarde. He never wold have gone to Sovngarde without a fight." When you have finished searching Jofnir's quarters you can show Aelif the evidence. Jofnir visited a place called Ragnthar, and spoke of meeting someone. "Interesting, interesting. Ragnthar is a Dwarven ruin. Why would he …? We must travel there, comrade. See if we can uncover more." There was a soul gem, and gem fragments, in his quarters. "Now Aelif is truly surprised. The Guildmaster had the magical prowess of a particularly slow horse. What was his doing at that ruin?" There were a number of Dwemer relics in his quarters. "Relics? Jofnir was no scribe. He was like most Nords this one has met: a warhammer diplomat. The Guild lost some contracts because of it, but the rank-and-file loved him." Once you have shown her at least one of the clues you have found, you can tell Aelif about the town he mentions in his journal. It will differ depending on your alliance. Perhaps we should go to the Baandari Trading Post, as well? His journal mentioned he stopped there. ""Good thought! Perhaps some in the guildhall saw him there. This one suggests you question our comrades at the Trading Post. Aelif will meet you nearby, she has some preparations to make." "Meet Aelif on the outskirts of the Trading Post. We will journey to Ragnthar together." Perhaps we should go to Bergama, as well? His journal mentioned he stopped there. "Good thought! Perhaps some in the guildhall saw him there. This once suggests you question our comrades in Bergama. Aelif will meet you nearby, she has some preparations to make." "There is an oasis near Bergama. Ogre's Bluff. Meet Aelif there, and we will journey to Ragnthar together." Perhaps we should go to Windhelm, as well? His journal mentioned he stopped there. "There is a bridge just outside the Windhelm gates. Meet Aelif there, and we will journey to Ragnthar together." After asking other Guild members about Jofnir and Ragnthar, you can meet Aelif at the meeting spot, where she is ready to enter Ragnthar. "Welcome! This one is anxious to get moving. Aelif will lead the way to Ragnthar, if you're ready?" "Here we go. Try to keep up, yes?" She will then run off in the direction of Ragnthar, while she leads you there, Aelif will tell you her own opinions on recent events. Aelif: "This one cannot wait to taste the air in Ragnthar." Aelif: "Jofnir visits a remote Dwemer ruin just before his death. No coincidence." Aelif: "And now the Guild openly oppposes a Daedric Prince! Risky, risky." Aelif: "To throw the guild against such power. Foolish." Aelif: "This one remembers when we fought Goblins, bandits." Aelif: "Small contracts. "One and done," yes?" Aelif: "Almost there. Be on your guard." Aelif: "And here we are. Ragnthar." Once you arrive at Ragnthar, there will be a barrier blocking the entrance. "Ragnthar is twisted out of space. This entrance here will allow us in. But it is not really here. If that makes sense? Lucky for us, Aelif came prepared. She can bring the door into focus. Let us inside." "In her travels, Aelif has learned little tricks and techniques. She has fought mages, Daedra, the undead. Even werewolves. You don't hunt monsters as long as she has without learning a thing or two." 'Aelif: "This one will just be a moment." Aelif: "The sound of gears … watch yourself!" When you enter Ragnthar you can ask Aelif what clues you should be looking for. "Aelif is certain this ruin will yield answers." "Anything to help explain Jofnir's death. Aelif is certain: it is no coincidence he came here just before he died. We will the connection somewhere in this warren of gears and pipes." After some exploring you will something that stands out, only to be stopped by a glowing gold barrier, which obscures what is there. "Are you well, comrade? Did it harm you?" I'm fine. What's going on? "A protective barrier. With something inside? Aelif can sense a great power here. Formidable. But this one knows a spell to negate it." You can bring it down? "Not without your assistance. Aelif will subdue the crystals. You must destroy them. Your window will be short. The spell is taxing, and Aelif can only maintain it for so long. Be quick." Can you go over it one more time? "Aelif will begin her spell. You run to each of the for crystals. The crystals empower the barrier. Destroy all four crystals, and the barrier will fall." Aelif: "Prepare yourself. Move your paws quickly." Aelif: "Now! Destroy the crystals!" When the last crystal is destroyed, it will reveal what was hidden. Aelif: "Good. Now to examine … the body?" If you speak with her she will say, "Quickly, comrade. Check the body." When you take the insignia, strange sounds will be heard around you. Aelif: "That … did not sound good." Several Dwemer machines will start attacking you. Aelif: "It us a trap!" Once you have defeated the machines, a more dangerous foe will appear. After defeating the Auroran Battlemage, you can ask Aelif what she knows. "Aelif is pleased to have you at her side." What was that armored creature? "They are called Aurorans. A strange type of Daedra, I think. Aelif has only faced them once before. If she recalls correctly, they choose their allegiances carefully. Very curious that we would face them here." Aelif, there was a guild insignia on the corpse. "Let Aelif see… this is Jofnir's! His body, here? But why? He was to be interred near his home in Eastmarch." The barrier was around his body. "Keeping us out, yes. But perhaps. Perhaps also keeping him in? Aelif has tried to have Jofnir summoned from Aetherius. And it has never worked. Perhaps now… Aelif has an idea." "Perhaps with the barrier down, we speak to him directly. This one knows how to reach out. Aelif can draw him to this place, so close to his body. What do you say? Are you ready to get some answers?" "You have seen the spirit of Jofnir, but always just for a moment. This one believes we can summon him. Speak to him. "Aelif told you, she has power. Magical gifts, connections to lands beyond. She will use them to draw the spirit to this place. Then we shall see, yes? We begin." Aelif: "Aelif will start the ritual." Jofnir Iceblade: "Who summons me?" Aelif: "Hush, spirit. Aelif will ask the question." Jofnir Iceblade: "What do you wish to know?" Jofnir Iceblade: "I will tell you what I can." Aelif: "Aelif demands the name of your murderer." Aelif: "Who killed you, Jofnir?" Jofnir Iceblade: "It was the Argonian, my subordinate, Sees-All-Colors." Aelif: "This one knew it would be so." Aelif: "Begone, spirit. Aelif is done with you." Jofnir Iceblade: "I have done as you asked. Release me to walk in Sovngarde." Aelif: "Go. Aelif will call for you again, soon." When you speak with Aelif afterwards, she will sound vindicated. "Perhaps for you. This one has suspected all along. The lizard was the one to become Guildmaster. The lizard was the one who set us on this crusade. Aelif smelled something foul on the wind." "Find Merric and the council. They are probably still in their moot at Vulkwasten. They need to know about this and they will heed your word. Aelif shall remain, and search for more clues." "Find Merric and the council. They are probably still in their moot at the Sentinel guildhall. They need to know about this and they will heed your word. Aelif shall remain, and search for more clues." "Find Merric and the council. They are probably still in their moot at Fort Amol. They need to know about this and they will heed your word. Aelif shall remain, and search for more clues." "This one knew Sees-All-Colors was responsible." 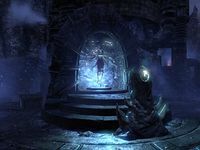 If you have completed the Fighters Guild questline, Aelif will be found imprisoned in the Heart's Grief Vestibule. If she is spoken to, she will bargained with you to release her. "Comrade … Aelif never thought to see you again. What are you doing here?" I'm here to stop your Master's plot. "Then … then you need Aelif. She worked at the Master's command for years. Quiet, careful. She knows things. Things... things you want to know." "Think of the things we did together, comrade. Our hunt for the traitor … fighting the Dwemer constructs. Remember Aelif—your friend." If you choose to release her, she will yell out "Master, no!" before she turns into a hostile Bloody Skeleton. This page was last modified on 6 February 2019, at 05:16.